Our Email Marketing platform creates a seamless bridge between Salesforce and your email marketing activities. Want to simplify the task of sending mass email campaigns to leads in Salesforce? Are you tired of manually exporting and importing between Salesforce and your email marketing platform? With our integration it couldn’t get any easier. Just select the message you want to send, choose the Salesforce report(s) that you want to receive the email message, and deploy. Job done. Once your email is deployed, tracking statistics populate each lead record, making it a “breeze” for sales reps to see and act upon your marketing initiatives. Email opens, clicks, and bounces become visible in Salesforce at both an individual lead level as well as an aggregate level. These results can also be leveraged to create new reports and action-oriented dashboards for sales reps. Contact your eMail Networks Sales Rep at sales@eMailNetworks.com for more information. Do not purchase or rent lists. Many purchased, rented or stolen lists contact “honey pot” email addresses maintained by the SPAM filtering organizations. If you sent to these address the organizations send an automated report to all major ISPs and SPAM filtering companies that mark you as a spammer or potential spammer. This flags the sender and sending IP addresses that there is problem and scrutiny of the sender and IP are increased. If a problem is severe or persists an IP or sender block is issued which can have a negative effect on your delivery results in the short and long term. Contact our support team at support@emailnetworks.com to discuss any questions about new lists before you import them into your White Cloud system. There is much email industry discussion about whether to design and send a mobile version of your email. Our eMail Networks’ White Cloud technology allows users to easily create and send a mobile version. We offer free consulting to help your organization determine if a mobile version is right for you at this time? Our mobile vs. non-mobile statistical reports will help make the decision. We will also review your breakout of how all of your emails are viewed an on which browsers. Contact your sales representative today for assistance in making this important email marketing decision. You have email subscribers, now what? SUMMARY: Email subscribers can be skittish and wary, particularly after just signing up for your email list. A recent MarketingSherpa webinar, “Three Strategies to Convert New Subscribers to Loyal Buyers,” focused on three tactics for optimizing your email campaign to create long-term relationships with subscribers. In this webinar recap, learn to ease new subscribers’ fears and lead them to conversion. Gradually get to know your subscribers, and turn them into loyal buyers by utilizing the following three tactics. “Even as email marketing becomes an elder in the family of marketing tactics, practitioners are still having trouble sending relevant communications,” said W. Jeffrey Rice, author of the MarketingSherpa 2012 Email Marketing Benchmark Report. “Only 28% of marketers reported that their messages contained relevant content, sent on time, and sent to their subscribers [with] a clear conversion goal,” Rice added, further citing the report. According to Rice, email marketers need to address the problem of how to create an optimal onboard experience to build a long-term customer relationship with the subscriber. “Just like in life, it is critical to make a great first impression,” Rice said. Rice and Meghan Lockwood, Senior Research Analyst, MECLABS, solve this problem with three strategies to convert new subscribers to loyal customers. The webinar can be viewed in full below. To help subscribers overcome the friction and downward forces that face them at every micro decision, marketers must lend them a helping hand. Sharing information of value to the consumer –, information that will make their life or job easier — creates an emotional connection and will leave an enduring positive impression. Newsletters, welcome emails and nurturing campaigns can be excellent opportunities to lay a foundation of trust, and this is especially true when the sale is not imminent. As a way of showing this good grace to subscribers, Rice encourages the practice of paying it forward. Remind the subscriber of where and how they opted-in to your list. Deliver value immediately, because, “as in most relationships, manners are important,” Rice said. He advises starting with a sincere thank-you. Give more than expected, share evergreen content (past newsletters, video links, webinars or podcasts), and give a discount or exclusive access. Confirm content and frequency expectations. “You also want to consider asking to be whitelisted,” Rice adds. Whitelisting provides subscribers the opportunity to do something to ensure their own deliverability. Additionally, the initial welcome emails should feature links to both the unsubscribe and privacy settings. “If a subscriber has buyer’s remorse and wants to unsubscribe, let them. It doesn’t hurt your deliverability at all. For people who are worried about what a company is going to do with their email address, you really want to calm their fears,” said Rice. “You want to take it slow. Just like when you go on a first date, you don’t want to ask someone their whole life story. … You want to get to know them on a gradual pace,” Rice said. Since opt-in pages request as little information as possible, take advantage of the high open rates of welcome emails to ask follow-up questions. Doing this will harvest more data and remind the subscriber of the win-win proposition. This is an opportunity to obtain additional demographic and preference data. By including a link to a preference center, you will collect more data to better customize your emails and offers to the subscriber’s specific desires. To illustrate this idea, Lockwood cites a MarketingSherpa case study of StudentBean.com, who set up its own welcome series. In this case study, StudentBean.com’s first step was setting up timing to where those who opted in received a confirmation email immediately, and a welcome email 24 hours later. The welcome series spanned six days total. Design the first welcome email: The first email’s goal was alerting the subscribers to the upcoming messages. This email is a reminder of the value of subscription. Set up offer strategy: Except for first email, each email should feature a single offer to spur action, based on popularity and profitability, as well as customized by location and self-reported gender. The goal of the series of emails is to quickly move the subscriber from “kicking the tires” to an educated buyer. Give the new opt-in something to look forward to with a popular strategy of developing a four-part series or a five-week education course. “You want to create content that they’re going to look forward to and anticipate receiving,” Rice said. “The second step to converting subscribers to loyal buyers is to really focus on increasing the responsiveness,” said Rice. To increase responsiveness, Rice recommends automated emails, especially for the initial welcome email. Automated emails are a single or series of emails created by a defined set of rules based on dates, events or behaviors that are automatically sent to a subscriber, and they consistently achieve higher open rates due to timing and relevancy. Research in the 2012 Email Marketing Benchmark Report shows that 80% of organizations already send automated welcome emails. “For many, the importance of the welcome email message cannot be understated. This is the first two-way conversation that prospects are going to have with your brand. Hopefully this is going to be the first step in transforming them from a fan to a customer to a brand advocate,” said Rice. Lockwood sites a MarketingSherpa case study to illustrate a reduction of reader anxiety with a campaign by SavvyMom, a Canadian digital publisher. SavvyMom’s first step was to define its messages and timing with the readers’ perspective in mind. This allowed the digital publisher to anticipate any needs or anxiety the readers might face. The overall goal of the series was to gradually warm the readers up to the brand, and then to teach them how they can best engage with it. The purpose of the first message was to guide subscribers to their next step, the second message to enhance the subscriber experience, and the third message increased the awareness of future emails. Personalizing content was SavvyMom’s next step. The personalization was based off how subscribers signed up. If they had done so through the website, dynamic text filled in the reader’s name and simply thanked them. If they had entered through one of SavvyMom’s contests, dynamic text reminded readers of the contest name. Immediately sending a welcome message can prevent future spam complaints while reinforcing expectations set during the opt-in process. This is a place to confirm the subscription, and restate the frequency to the subscriber. Rice also suggests sending a double opt-in welcome message from a separate server until you determine the addresses are accurate, to avoid hurting the sender reputation of your main IP address. “You have earned a click to your registration page. That’s huge, that’s a gigantic win. So you want to maintain that momentum by paving a path of logical next step for new subscribers to follow,” Rice said. To establish those expectations with regard to design, Rice advises reviewing registration page design to maintain creative consistency. The registration page’s style should be similar to the style of the ad or email that brought visitors to it. With a consistent brand image, language and tone, the potential subscriber will be comforted in knowing he or she has landed on the correct page. Finally, Rice says the key to enacting these tactics is to “review your email from your subscriber’s point of view.” The brand definition of compelling content may differ from recipients’, and consistently delivering what was promised to the subscriber, with consideration to their needs, should be the primary goal of marketers. Goldfig Travel caters to both consumers and business customers looking to book high-end, upscale travel. The company’s business clients are unique in that they are just as likely to jet off to to an overseas business meeting as they are to take colleagues on a personalized safari. Email marketing is an important part of Goldring’s overall marketing strategy. Below, Goldfig details four other email tactics that he uses to entice and interest his business customers. Use triggered emails to support sales, and not just before you make a sale. Most companies use triggered emails to remind people when their subscriptions are almost up or when new products are released. Goldfig, however, uses triggered emails post-sale with good results. A week before clients leave, an automatic email is sent to remind them of the trip. Customers get another email soon after they return. “It gives them a way to tell me if they had a great trip or had any problems,” he said. “I want to reach out to them before they reach out to me.” It also presents a perfect way to inquire about future travel needs, he said. If there is any topic that makes a marketer wonder, it’s email launch times. Most marketers don’t want to send on Monday or Friday, fearing their email will be ignored; Mondays feel too early in the workweek, while Fridays are too late. Tuesdays have been noted by many as being the best time for sending B2B emails, but does that hold true for your database? Here are some tips for planning your email schedules and testing which days and times work best. First, consider your message and audience. B2B, B2C, etc. Who is receiving the email and when would “they” most likely want to receive it? Or better yet, when have they responded the best in past email campaigns? Pay attention to time zones. Find the optimal time to send emails across time zones, or segment your lists by region to be conscious of time differences. An email sent at 3 p.m. PDT may be ignored by your East Coast audience. Send in the early morning or after-hours. Some marketers are seeing better response rates with after-hours and early-morning sends (between 3 a.m. and 6 a.m.)—times when recipients’ inboxes are not as jammed. Consider Sunday evening sends. Weekend warriors or busy executives seeking to get a head start on the week check emails on Sundays. Follow up after events, whether live or virtual. Sending a follow-up email 24 to 48 hours after the event is optimal to connect with attendees. For live events, be aware of travel times so your follow-up does not get lost in the shuffle of attendee travel. There are no hard and fast rules for scheduling an email send. Variables such as list segments, time zones and channels make it necessary to test your lists and sends. Create a baseline with your open and click-through rates, and trend against these metrics to figure out which days and times work best for you. Do you want your eMail critiqued live? 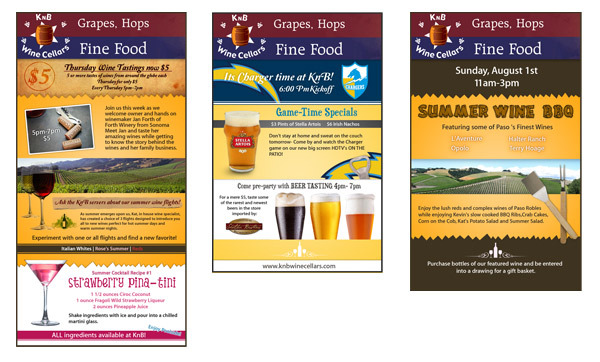 KnB Wine Cellars requested new email templates and four color print coupons from our design team. If you are interested in custom designed email templates or artwork for four color printing please give us a call at (866) 271-5908.